Megachle texana Cresson, 1878. Trans. Amer. Entomol. Soc. 7: 125 (♂ only). Megachile generosa Cresson, 1878. Trans. Amer. Entomol. Soc. 7: 125 (♀). Megachile cleomis Cockerell, 1900. Ann. Mag. Nat. Hist. (7) 6: 13 (♀ only). 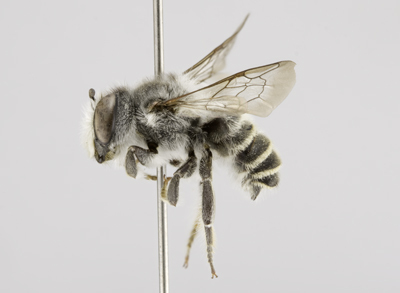 Megachile pruinosa Friese, 1903. Ztschr. System. Hym. Dipt. 3: 246 (♀, ♂) (preoccupied). Megachile schismatura Cockerell, 1908a. Ann. Mag. Nat. Hist. (8) 1: 267 (♂). 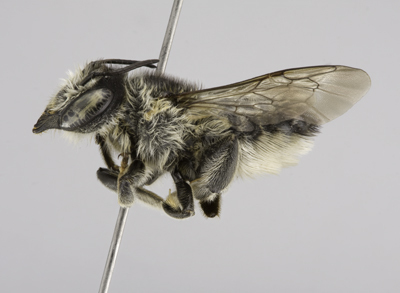 Megachile vernonensis Cockerell, 1912. Can. Entomol. 44: 354 (“♀” = ♂). 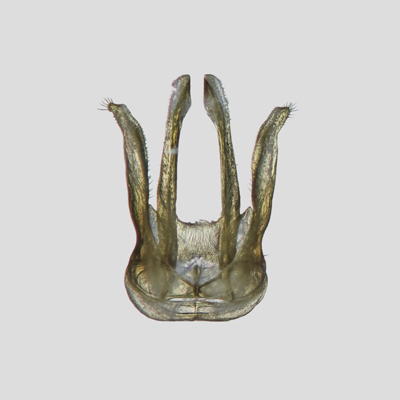 Diagnosis.The female of M. texana can be recognized by the combination of 4-dentate mandibles with the emargination between inner and 3rd teeth being approximately semicircular (i.e., its greatest depth subequally distant between the two teeth), T6 distinctly concave in lateral view with intermixed short, erect black pubescence, and silvery-white appressed pubescence in apical half, numerous stout, erect, black hairs laterally on T2‒T6 (visible in dorsal view), and S6 with scopal hairs entirely black. They are most similar to M. lippiae. Females of M. lippiae are typically paler; the stout, erect, black hairs on the metasoma restricted to the apical terga when present. 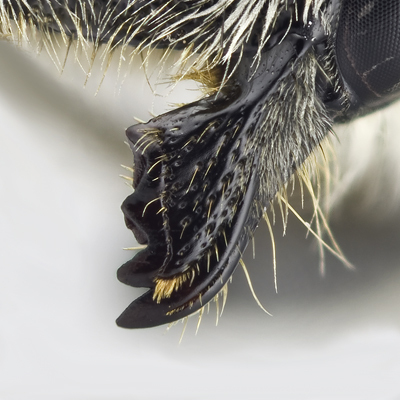 The male can be recognized by the combination of 3-dentate mandibles, simple, dark front tarsi, front coxa possessing a small spine, dorsal surface of mesosoma with a considerable admixture of black pubescence. They are most similar to M. lippiae. Males of M. lippiae typically have the dorsal surface of mesosoma with a slight, if any, admixture of black pubescence. 1) compound eyes slightly convergent below; distance between lateral ocelli and vertex subequal to distance to eyes, 2) clypeal margin straight and simple, 3) mandibles distinctly 4-dentate, with an incomplete cutting edge between 2nd and 3rd teeth, complete between 3rd and 4th teeth (Figure M13), 4) gena slightly narrower than compound eye (5:6), 5) punctures quite deep and distinct, rather fine, well separated across vertex, becoming somewhat more fine, shallow, close and obscure on gena, very close and deep on frons, very fine and densely crowded on paraocular area beneath dense pubescence, separated on clypeus medially, and well separated on supraclypeal area medially, with a large impunctate area, becoming somewhat closer laterally, 6) pubescence whitish, rather short but dense around antennae and paraocular area, on gena below, becoming somewhat short and sparser above, black on vertex, 7) F1 longer than broad (3:1.5), almost twice as long as pedicel and F2, which are subquadrate, remaining flagellomeres slightly longer than broad (2:1.5), apical flagellomere elongate, about twice as long as broad. 1) pubescence white, short but rather dense laterally and posteriorly, black over most of mesoscutum and scutellum, scutello-mesothoracic suture with some very fine, obscure, pale tomentum, and mesoscutum with some whitish pubescence anteriorly, 2) mesoscutum dull, punctures rather fine, irregular, well separated in centre, becoming very close anterolaterally and along posterior margin; punctures slightly separated in median area of scutellum, becoming finer and densely crowded laterally and on axilla; pleura very finely and densely punctate above, becoming somewhat more coarsely and distinctly so below; propodeum somewhat smoother, punctures very minute, close and obscure, triangle dull and impunctate, 3) mid and hind basitarsi nearly as broad and about as long as their tibiae, spurs yellowish, 4) tegula very minutely and closely punctate, 5) wings subhyaline, faintly clouded apically, veins black. 1) T2-T5 with complete, transverse, basal grooves, basal margin of each distinctly carinate, apical margins rather deeply depressed laterally, less so medially, margins very narrowly hyaline and completely white fasciate, fasciae narrow medially, becoming broader and dense laterally; discal pubescence short but erect, entirely black, T1 with some blackish pubescence laterally on disc, otherwise relatively pale, apical fascia very thin but complete; punctures fine, very close on T1 and T2, becoming more distinctly separated on T3-T5, somewhat coarser and more sparse toward apical margin of each plate; T6 distinctly concave in profile, with abundant, erect pubescence evident, largely black with the more apical pubescence subappressed and pale, punctures very fine and densely crowded, 2) S6 rather well covered with black scopal hairs, with a dense, apical fringe of very short, black hairs, scopa otherwise yellowish-white, becoming black apically on S5; sterna closely and deeply punctate, very finely so on the more basal plates, becoming more coarse and sparse on the more apical plates. 1) compound eyes slightly convergent below; lateral ocelli slightly nearer eyes than margin of vertex (7:8), 2) clypeal margin very slightly produced medially, narrowly polished and impunctate, very slightly incurved, 3) mandibles 3-dentate, basal process triangular, subbasal in position, 4) gena subequal to compound eye in width, 5) punctures deep and distinct, rather coarse and well separated across vertex; becoming finer, closer and more obscure on gena, coarse and contiguous on frons, paraocular area and supraclypeal area finely and densely rugose beneath dense pubescence, basal half of clypeus coarsely and closely punctate, punctures separate medially by ≤ 1 pd, becoming minute and dense toward apical margin, 6) pubescence around antennae and over lower half of face white, dense and quite elongate, more snowy-white and copious on gena below, becoming sparse above, black on vertex, 7) F1 about as long as broad and subequal in length to pedicel, shorter than F2, which is longer than broad (3:2), remaining flagellomeres slightly longer (3.5:2), apical flagellomere more elongate (4:1.5). 1) pubescence white laterally and posteriorly, black on central area of mesoscutum, with a few, erect, black hairs on scutellum, 2) punctures of mesoscutum close and rather coarse, slightly separated only in median area of disc, very close on scutellum and densely crowded on axilla; pleura dull, punctures densely crowded, propodeum somewhat more shining, with shallow and rather vague punctures evident, well separated (> 1 pd), triangle somewhat shiny and impunctate, 3) front coxal spine rather short but well developed, narrowly rounded apically, densely long pubescent posteriorly; spurs yellowish, mid tibial spur short but well developed; all basitarsi relatively slender and short, 4) tegula very minutely and quite closely punctate, 5) wings subhyaline, somewhat darkened apically, veins black. 1) T1-T5 rather deeply grooved across base, basal margin of groove conspicuously carinate, with narrow pale tomentum arising from carina, apical margins narrowly depressed across entire width of the more apical terga, more so laterally, with entire, white fasciae that are dense laterally, quite narrow or interrupted medially; discal pubescence pale, elongate, quite erect and conspicuous on T1, shorter on the following segments, black toward apical margin of each; punctures fine and close on T1 and T2, more distinctly separated on T3 and T4, rather coarse and somewhat closer on T5, apical margins of discs of T4 and T5 considerably overhanging the depressed apical rims laterally; T6 quite broadly and densely whitish tomentose above, carina with a deep, semicircular, median emargination, margins on each side subentire, median teeth of apical margin considerably nearer lateral teeth than to each other, 2) S1-S4 exposed, shining, rather closely and coarsely punctate on the more basal plates, becoming rather sparse on the more apical plates, apical margins depressed, yellowish-hyaline, discal pubescence copious but sparse, not hiding the surface, quite densely fasciate on S2 and S3. This common species is very similar to M. lippiae, both morphologically and based on CO1 divergence levels of 2.59%. Krombein (1953) and Eickwort et al. (1981) discussed the nesting biology of this soil-nesting species (Table 1). 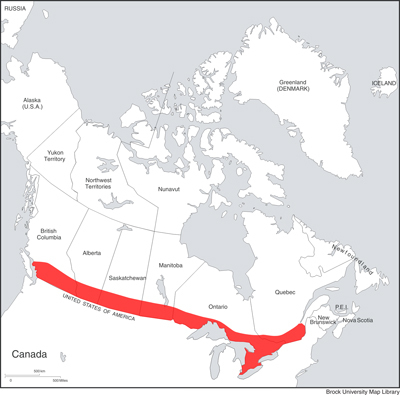 Common throughout southern Canada from QC-BC (see Map 13).